If you’ve spent any time on the waters of Long Island Sound in the last 50 years, chances are you’ll have crossed paths, wakes or tacks with one of the more elegant and beautiful wooden sailing yachts afloat – the Schooner Yacht Brilliant. She was designed by Sparkman & Stephens and built by the Henry B. Nevins Shipyard in City Island, NY for Walter Barnum. Barnum specified the very finest materials for his yacht so she would be capable of a voyage around the world. Measuring 61’ 6” LOA with a 14’ 8” beam and a 9’ draft, her teak on oak frame construction was roomy and fast and, as it turns out, substantial. Her very first refit only took place in 2007, when her teak deck was replaced. Shortly after her launch in 1932 she set a record for vessels of her size, running from Nantucket Lightship to Bishop Rock Light, England in 15 days, 1 hour and 23 minutes. Although she entered several Bermuda Races and acquitted herself well, she never managed to win the race to the Onion Patch. In 1940, Barnum sold Brilliant to Henry E. Bodman of Detroit, MI, who cruised her on the Great Lakes until William W. Spivy bought her in 1942 and donated her to the U.S. Coast Guard, who ran her as part of the World War II antisubmarine “Picket Navy” patrol out of St. Simon’s Island, GA. After the war, flamboyant yachtsman and race car driver Briggs Cunningham bought her at auction, and cruised and raced her for many years out of the Pequot Yacht Club in Southport, CT. Cunningham, the winning skipper in the 1958 America’s Cup, re-rigged her to accommodate larger sails, adding a self-tacking forestaysail and a Bermuda main (replacing the original gaff main). In 1953, Cunningham donated Brilliant to Mystic Seaport in Mystic, CT to serve as a sail training vessel. Mystic is still her homeport today where she’s maintained in Bristol condition. Over the years she has carried some 9,000 students and classic boat enthusiasts, logging the equivalent of five circumnavigations of the globe. Along the way she was named “Sailing Vessel of the Year” and is a perennial winner at classic yacht regattas along the East Coast. In 1992, Mystic Seaport asked famed marine artist John Mecray to help commemorate the 60th anniversary of Brilliant’s launch by creating the memorable painting you see here. Over a period of six months, John consulted with every possible source to ensure the accuracy of the painting, including the highly detailed Sparkman & Stephens’ plans, a full-scale model of the actual vessel (built in the 1935 by original crew member Joe Appleton), past Brilliant captains Biff Bowker and George Moffett, and most amazing of all, her original designers Olin and Rod Stephens – both in their late 80s at the time, but possessing critical information including firsthand recollections of Brilliant’s trial runs. Fittingly, John’s stunning painting shows this magnificent yacht during one of her shakedown runs with owner Walter Barnum depicted at the helm and young designers Olin (with glasses) and Rod Stephens in the companionway. Note the subtle shadow of a crewmember on the foredeck through the sail. While there is only one original Brilliant painting, Mystic Seaport published a special limited edition lithograph of this painting as part of the yacht’s 60th anniversary, with framed editions including one signed by the skippers, another signed by Olin and Rod Stephens, and even one framed with a piece of Brilliant’s original sail cover. While those lithographs originally sold for $850 and $1,200, they’re now trading in the $1,400 to $1,800 range…if you can find one. Today, Brilliant berths 12 crewmembers and Mystic Seaport offers cruises for adults and young people. For more information, visit mysticseaport.org. 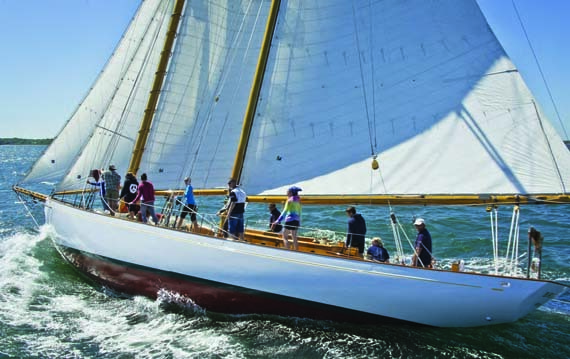 After a stint as a successful commercial illustrator and instructor at the Philadelphia College of Art, John began what was to become his full-time passion – recreating America’s great sailing yachts with a move to Newport, RI in 1976. There he became acquainted with the world’s prominent yachtsmen, joining Ted Turner and Gary Jobson aboard the America’s Cup winner Courageous in 1977 as a member of the afterguard. In subsequent years, his devotion to yachting led him to help found both the Museum of Yachting and the International Yacht Restoration School in Newport. Through his unflinching eye, attention to every detail and meticulous craftsmanship, his paintings have helped bring alive the majesty of the great sailing yachts for generations to come. To view this painting online, visit the J. Russell Jinishian Gallery website at jrusselljinishiangallery.com or visit the gallery in its new location at 1899 Bronson Road in Fairfield, CT. As the nation’s leading gallery specializing in fine marine and sporting art since 1997, the J. Russell Jinishian Gallery represents over 100 of the world’s leading artists, with an extensive inventory of over 1,000 paintings, drawings, sculpture, scrimshaw and ship models in a wide variety of subjects, styles and prices.